Us boardgamers can make pretty much anything competitive, and even making blankets is not beyond that. But there are limits to what we can do. 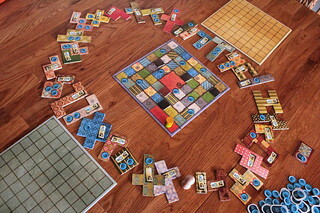 A patchwork competition with more than two participants would be one of them, and so Patchwork is strictly a two player game. Each player’s goal is to complete as much as they can of their blanket, which has 81 squares that want to be filled with cloth patches. Both players take those patches from the same box of leftover cloth – well, not really a box, more of a ring of cloth pieces laid out on the table. They’ll have to compete for the best pieces to make their blankets. Not that there are many good ones, most are a royal pain to try and fill a square with. The competition for cloth patches doesn’t happen with players taking turns, like most boardgames still have it. The main thing you need to make a patchwork blanket is time, and that’s what determines turn order in Patchwork. Both players have a pawn on the time board, and whoever has spent less time on their blanket so far takes the next turn. The other thing you need to make a blanket are buttons – at least in Patchwork you do. Buttons are the currency used to buy patches. If you’re low on buttons and it’s your turn, earning buttons is one thing you can do: you move one space ahead of your opponent’s time piece and take one button for each space you walked that way. But taking buttons doesn’t finish your blanket, what you really need is patches. That’s the other thing you can do on your turn, if you don’t need the buttons right now. Remember that all the patches are laid out in a ring. Somewhere in this ring, between two patches, stands a pawn the two players share. When taking a patch, you may pick from the next three patches clockwise from the pawn. You move the pawn forward and take the patch, effectively replacing it with the pawn. Then you pay the number of buttons shown on that patch’s price tag, move forward the number of time units also indicated on the tag, and then you fit that piece of cloth into your blanket as well as you can. Try not to create too many holes of only one square in your blanket, the only way to get patches for those is to be the first to cross certain lines on the time track. And that, believe it or not, is pretty much all of the game.When both players reached the end of the time track, you count points, one point per button, minus two points for each open square in your blanket, and the player with the higher score wins. It’s a bit surprising, from the designer that gave us the games mentioned above, to have a game that can be taught faster than I can unpack all the pieces of Fields of Arle. 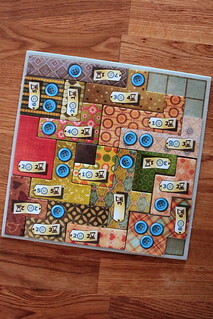 But don’t underestimate Patchwork because its rules are simple – there is a lot of tactical depth here. Time and buttons are two currencies to juggle, but time is the more interesting one here. Spending a lot of time at once has its benefits, that’s how you buy big patches of cloth, after all. But doing so may give a clever opponent two or even three moves in a row, and those may end up being more valuable. You can do a lot of things with three turns. It’s a good idea to make your big moves when your opponent is low on buttons, so he can’t do too much with those moves. You also have to pay attention what patches will be available to your opponent after you move the selection pawn; if it would bring a patch they desperately need in range, maybe try and force them to move first. Patchwork may look, at first, like you’ll give most thought to filling the blanket, but that’s far from your greatest worry. But you have to pay attention here, too, if you don’t want to end up with a hole you can no longer fill with the remaining patches. Or you end up without any buttons showing on your blanket, and those things pay you buttons on some spaces of the time track. Not having them in your blanket means you have to spend more time taking buttons, and you really don’t want that. I guess Patchwork is not an automatic must-have for all fans of Uwe Rosenberg. It is a different breed from Agricola, for instance, and if another game in that league is what you wanted from Uwe, then Patchwork isn’t it.Fortunately, he hasn’t stopped making that type of game, A Feast for Odin looks very promising. 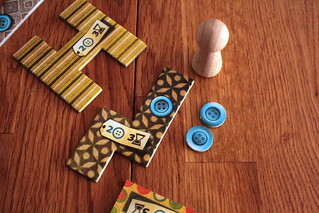 But in its own league – two player games in 30 minutes – Patchwork is every bit as brilliant as his other games. It’s a simple game that requires a lot of foresight to play well. You won’t make big, impressive, board-sweeping moves. It’s many small decisions that will bring you out ahead in the end. And don’t worry about the theme being bland; I didn’t think I would enjoy a game about making a blanket, but I had a great time every time I played.